Burberry The Beat For Men is a woody fragrance with pulsing energy that embodies a blend of British heritage and edgy attitude. Vibrant cedrat, black pepper, and violet create an initial burst of freshness that melts into an elegant, timeless heart of leatherwood and vetiver bourbon. 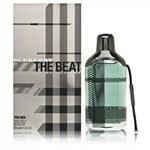 The effect is a mirror of modern Burberry masculinity fueled by the dynamism of music and fashion. The scent exudes rhythm, style, and sensuality. Muito boa a fragrância. Gostei!!! hard black pepper note right off the bat, but it dissipates into a great woodsy tone. you'll read reviews where people knock on how overpowering it is, but if its used correctly its perfect. truly is a one of a kind smell, but ive never had so many compliments. my favorite fragrance for sure.